Common Names: Pomegranate, Granada (Spanish), Grenade (French). Habit: Upright, many stems. Showy red-orange flowers in summer and yellow fall color. Narrow, glossy leaves, bronze new growth. Culture: Any soil, in almost any location. Quite tolerant of various soils and heat. Full sun for best blooms and fruit. Drought tolerant. Severely injured by temperatures below 12° F. can be grown outside as far north as southern Utah and Washington, D.C. but will seldom set fruit in these areas. Adapts well to container culture and will sometimes fruit in a greenhouse. Uses: Specimen, barrier, summer color, delicious fruit with some medicinal properties. Problems: Few that are serious. 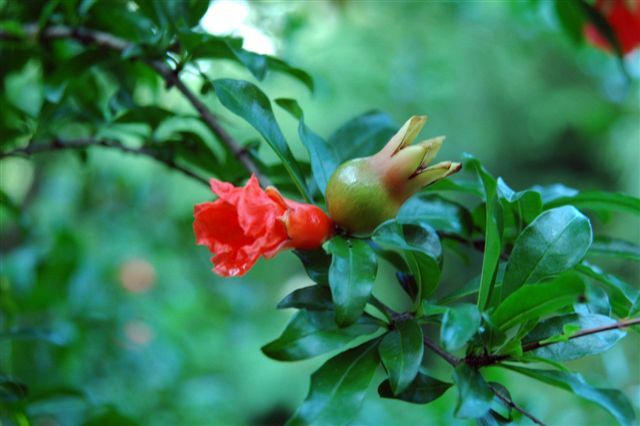 Notes: Like other deciduous flowering shrubs, the pomegranate has not been used enough. Several improved cultivars exist – ‘Albescens’ is a white flowering selections. Origin: Native from Iran to the Himalayas in northern India and was cultivated and naturalized over the whole Mediterranean region since ancient times. Widely cultivated throughout India and the drier parts of Southeast Asia, Malaya, the East Indies and tropical Africa. Was introduced into California by Spanish settlers in 1769. Growth Habits: Rounded shrub or small tree that can grow ultimately to 20 or 30 ft., but more typically to 12 to 16 ft. Has a strong tendency to sucker from the base. Specimens are known to be over 200 years old but then tend to decline after about 15 years. Foliage: Leathery leaves that are narrow and lance-shaped. Flowers: Scarlet, white or variegated flowers are over an inch across and have 5 to 8 crumpled petals and a red, fleshy, tubular calyx which persists on the fruit. Flowers may be solitary or grouped in twos and threes at the ends of the branches. Self-pollinated as well as cross-pollinated by insects. Cross-pollination increases the fruit set. Wind pollination is insignificant. Fruit: Nearly round, 2-1/2 to 5 in. in size crowned at the base by the prominent calyx. Tough, leathery skin or rind is typically yellow overlaid with light or deep pink or rich red. Interior is separated by membranous walls and white, spongy, bitter tissue. Fruit sacs are filled with sweetly acid, juicy, red, pink or whitish pulp or aril. One angular, soft or hard seed per sac. 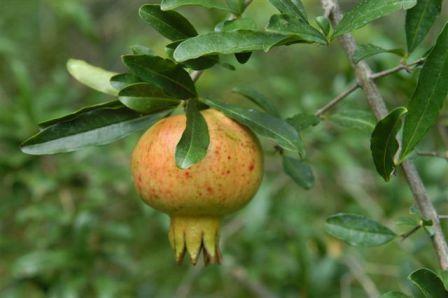 The pomegranate may begin bearing in 1 year after planting out, but 2-1/2 to 3 years is more common. Fruit should mature some 5 to 7 months after bloom. Pruning: Since the fruits are borne only at the tips of new growth, branches, should be judiciously pruned the first 3 years to encourage the maximum number of new shoots on all sides. After the 3rd year, only suckers and dead branches are removed. Pests: Relatively free of most pests and diseases. Minor problems are leaf and fruit spot and foliar damage by white flies, thrips, mealybugs and scale insects. Roots are seldom bothered by gophers but deer will browse on the foliage. Harvest: Fruits are ripe when they have developed a distinctive color and have a metallic sound when tapped. Tend to crack open, particularly when rained. Equal to the apple in having a long storage life. Improve in storage, becoming juicier and more flavorful. Uses: Clusters of juice sacs are eaten and also make an attractive garnish when sprinkled on various dishes. Juice can be used in a variety of ways: fresh juice, jellies, sorbets or cold or hot sauces as well as to flavor cakes, baked apples, etc. Pomegranate syrup is sold commercially as grenadine and the juice can be made into wine. The sour pulp is boiled to make syrup for perfume and sourness in Middle Eastern Food. Seeds dried with their aril are the sour India Condiment anardana. The rind is used to treat dysentery, the root bark to treat tapeworm. Fruits, rind and bark are used in dye making. Cultivars: Balegal, Cloud, Crab, Early Wonderful, Fleshman, Francis, Granada, Green Globe, Home, King, Phoenicia, Sweet, Utah Sweet, Wonderful. ANSWER: I have had good results after spraying regularly with compost tea or Garrett Juice. Adding fish emulsion and Bio Wash.
Q. What's the big deal about pomegranates? Is it true they have medicinal properties? A. Throughout the ages, pomegranates have been revered for their medicinal properties and restorative powers. In fact, the fruit has been considered sacred in many religions around the world - from Christianity, Judaism and Islam to Buddhism, where it is one of the three blessed fruits. Modern research shows that pomegranates contain compounds such as tannins and antioxidants that can have beneficial effects on the cardiovascular system and prostate gland. Research published in September in the American Journal of Cardiology showed that 45 heart disease patients who consumed one glass of pomegranate juice daily for three months had improved blood flow to their hearts. According to Dr. Dean Ornish, pomegranate juice may reverse heart disease through its ability to inhibit plaque buildup in arteries. Pomegranate juice may also be beneficial to men with erectile dysfunction due to clogged blood vessels. A study published in the Journal of Urology in July 2005 found that antioxidants found in pomegranate juice, along with other drinks high in antioxidants like blueberry juice, cranberry juice, orange juice, and green tea, improved erectile response. In September 2001, a study published in the journal Atherosclerosis showed that some antioxidants in pomegranate juice could reduce blood pressure through their ability to affect the activity of an enzyme called "serum angiotensin converting enzyme." Men with prostate cancer may also benefit from pomegranate juice. Researchers at the University of Wisconsin found that pomegranate extract may prevent prostate cancer or slow its growth. Their findings showed that prostate specific antigen (PSA) - which, when high, is an indicator of prostate cancer - was substantially lower in mice that were given pomegranate juice. Research published in the Journal of Medicinal Food found that pomegranate-derived compounds demonstrate considerable anti-tumor activity in the human prostate. A study led by Dr. Allan Pantuck of UCLA involving 48 men with recurrent prostate cancer showed that drinking 8 ounces of pomegranate juice daily significantly increased the time it took for PSA levels to rise. In addition, there was decreased cancer cell division, decreased proliferation of cancer cells and increased cancer cell death. If you want to prevent or treat cardiovascular disease or prostate cancer, drinking the juice of this long-revered fruit may help you live a longer and healthier life.